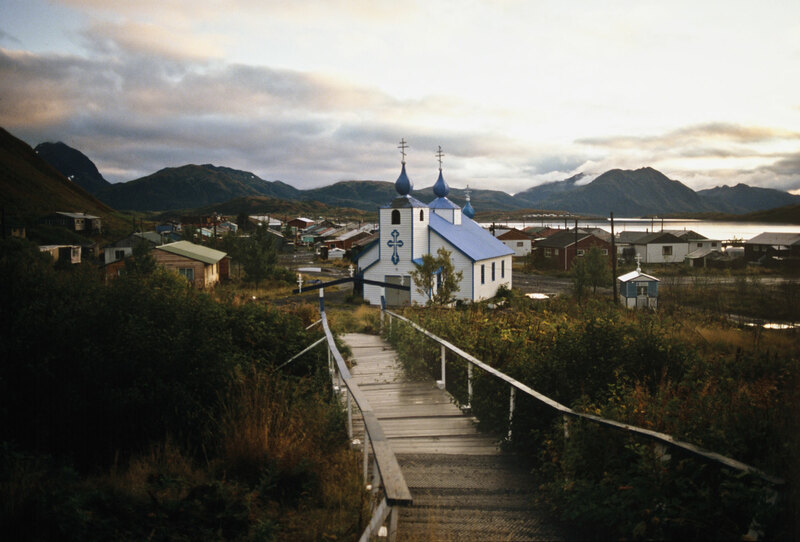 A Scandinavian Culture & Film Fest on Kodiak, a remote island in Alaska! Great success! How is that possible? Well, because there is something special about the people on the ”Island of the Great Bear.” They come from many different countries and cultures: Europeans, Mexicans, Filipinos, Samoans, Sugpiaqs, et al., as well as all of those with Scandinavian heritage. In earlier blogs I’ve written about many of my friends on Kodiak who’s father or grandfather came from Scandinavia. From November 6 -12, 2017 we highlighted Scandinavian culture. During the festival participants could learn to bake Norwegian lefsa, research genealogy, discover Scandinavian history, clothing and tools, and find out about the Sami reindeer herders of Alaska. Hundreds of students learned about Scandinavian music and dance, and even built simple instruments similar to those the early immigrants had brought with them from Scandinavia. There was a lecture on the Finnish influence on Alaskan architecture, and a Crosscut Saw where participants had to learned to work together using the 2-man saws that were used in logging before we had chain saws. 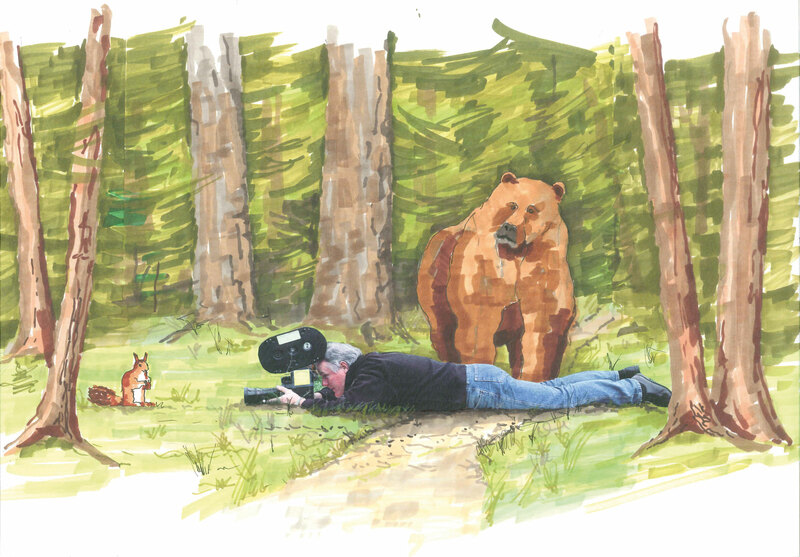 I first came to Kodiak 30 years ago, in 1988, with the plans to produce a film about the Kodiak bear, an idea that developed into so much more. I met Mike Rostad, a young man from Minnesota with Norwegian roots. Mike was interested in people and their stories, an enthusiasm that rubbed off on me. When I realized that most of the native people on Kodiak were also of Scandinavian heritage, I was intrigued. How had that happened? I began interviewing people and heard many exciting stories about people from a far-away land, about overcoming difficulties and remarkable encounters. My film archives expanded with hundreds of hours of interviews. It must be more than 10 years ago that Mike Rostad approached me with the idea of arranging a festival centered around the film material I had collected throughout the years. It was a good idea, but kind of daunting so I pushed it off into a distant future, but Mike didn’t give up. He kept asking me year after year, coming with different ideas about a Scandinavian film festival. Last fall, 2016, we called our first meeting, planning for the festival. There were many different ideas and opinions about what should be included in the festival, but Mike took the helm and steered the committee until November 2017 when the first Kodiak Scandinavian Culture & Film Fest opened. The festival was a great success and all who participated were amazed and grateful that we had organized an event like this on Kodiak. For my part the festival became a sort of film editing marathon. I began last winter to organize the enormous amount of material I had accumulated over 30 years. All available time went to working with he films I planned to show at the festival. But, like so often happens, I was working up until the very last minute. I planned to show seven longer documentaries, plus a few shorter bonus films. This was, as far as I remember, the largest project I have ever worked with. Luckily I had jetlag from the 10 hour time difference from Sweden. I’d wake up at 2 am every morning, but that was ok. I’d get up and start working and then continue throughout the day. For 10 days prior to the festival and throughout the festival week I worked nights polishing the films I would be showing. There is always small details that need adjusting – sound, lighting, music and transitions – things most people don’t notice but that I wanted to get done to make the films as nice as possible. There were many people involved, and who were a tremendous contribution to the festival. Four of our friends from Minnesota, Ross, Art, Bruce and Char came to Kodiak and added luster with their music and dance. Everyone on the planning committee and in charge of various events deserve a round of applause, but without Mike and Kathy Rostad’s early vision and diligens the festival could never have happened. 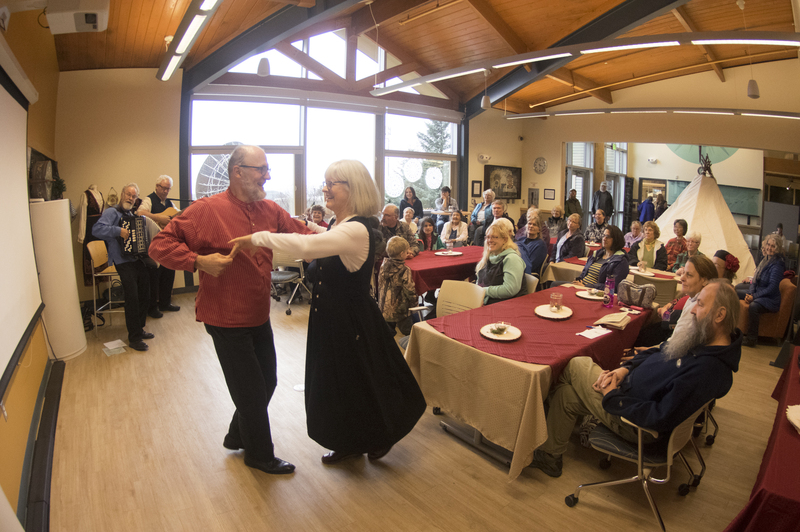 Plans for another Kodiak Scandinavian Culture & Film Fest are already underway! The vision lives on! One day, we took a boat to Larsen Bay to visit with Jerry and Elaine Johnson. I knew that Jerry had some interesting stories about his father, who was born in Norway and had been Al Capone’s personal mechanic. 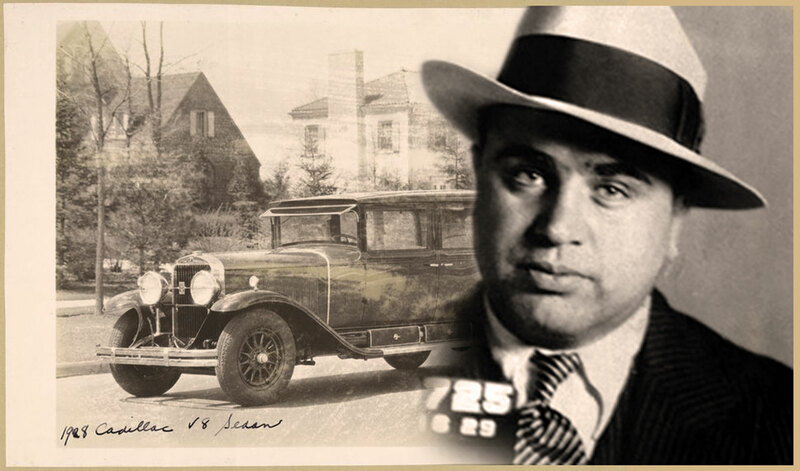 Alphonse Gabriel “Al” Capone, a.k.a. Scarface, the notorious Chicago gangster of the 1920s, is probably best remembered for the Valentine’s Day Massacre in which he annihilated members of the O’Bannion gang. “Dad said that he was a good employer. He always paid on time, and he never tried to cheat you.” It was his attention to detail that finally got him arrested. He kept careful records on all his business deals and was convicted for tax evasion. When Capone went to jail, Jerry’s family moved to Alaska, and his dad got a job as an engineer at the cannery. 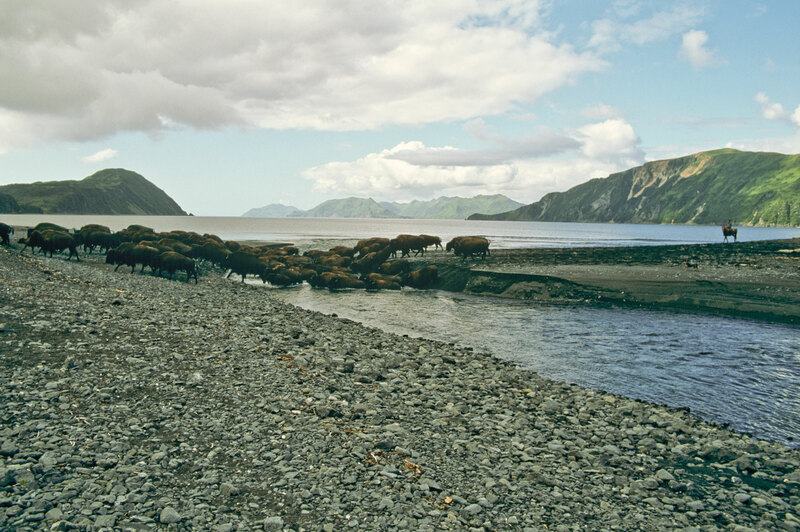 Narrow Cape, the beach at Burton’s buffalo ranch, is a place on Kodiak I return to often. This is, without a doubt, the end of the road – as far out into Kodiak’s wilderness that you can come by car. Indeed, before the Kodiak Launch Complex was built in the late 1990s, the road was sometimes impassable. Back then, the 45-mile trip from Kodiak to Narrow Cape could take two to three hours. In the late 1980s, the only paved roads were in the city. “The Road,” as it is called, was only gravel, and often riddled with deep holes and large rocks that had to be carefully avoided. The trip was long and tedious, and very few people ever bothered to visit Narrow Cape. To get to Burton’s ranch, you drive east from the city along the winding road that follows the rugged coastline, rounding three inlets, Womens, Middle and Kalsin Bay. With all the twists and turns, the distance is more than doubled, but behind every curve awaits a new awe-inspiring view. The steep mountain slopes are blanketed in plush, green vegetation, dotted with wildflowers in white, blue, red, and yellow. Just before turning off toward Burton’s ranch, the road passes Pasagshak Bay, a cove that, in the right light, resembles a tropical sea. There are always at least one or two people fishing in the Pasagshak River, which empties into the bay. During the Silver salmon run, the riverbanks are crowded with eager fishermen from Kodiak. After Pasagshak, the road turns up into the mountains where the buffalo graze. Twenty years ago, when the road was at its worst, it was necessary for someone to walk ahead to guide the driver past the worst of the holes and rocks. Just before reaching the ranch, the road crosses a small creek. Today there is a bridge, but when I first came out here, there were only a few logs thrown across the ravine on which to cross. Visiting the ranch used to mean a lot of extra wear and tear on the vehicle. Several times I’ve had not one but two flat tires driving from the ranch. Once, when I was approaching Narrow Cape, we heard a loud crash followed by a nasty crunching noise under the car. Jumping out to inspect the damage, I saw that the exhaust system had caught on a huge rock. Carefully, I put the car in reverse and backed up slowly, but the exhaust pipe was torn loose. After that, the car sounded like a Formula 1 race car. The first time I visited Burton’s ranch, I felt like I’d entered a time warp. Animals wandered freely between the rugged buildings. Horses stood, saddled and ready for use. Until the late 1990s, the horse was the primary mode of transportation on the ranch. Ranch owners Bill and Kathy Burton and their son, Buck, were living the life I’d dreamed of as a boy. The first time I met Bill, it was like reuniting with a long-lost friend. For Bill, no one was a stranger. Bill Burton came to Kodiak from Florida in 1966, to work at Joe Beaty’s ranch by Narrow Cape, which at that time was a traditional cattle ranch. The following year, Bill and his wife, Kathy, decided to buy the ranch from Joe and stay on Kodiak. Unlike cattle, buffalo retain their natural instincts and are better equipped to defend themselves against bear attacks. A bear that has once approached an angry buffalo will seldom make the same mistake again. Exchanging cattle for buffalo proved to be a profitable venture. Not only can the animals protect themselves, but the meat is also more valuable, and the bulls are attractive trophy animals for hunters. Today the herd has grown to over 500 head and is the largest buffalo herd in the state. The ranch is enclosed by a high mountain range that meets the ocean. There is no need for fencing and the buffalo roam freely. The road out to Pasagshak Bay is the only breach in the natural enclosure. When too many buffalo have wandered off, the Burtons gather a posse on horseback to drive the animals back over the Pasagshak River and up through the passage where the road winds along the bay. I’ve participated in a few of those drives. Sitting on horseback, driving a herd of buffalo through one of the most scenic areas on earth has been the fulfillment of all my boyhood dreams. Excerpt from the book “Kodiak, Alaska – The Island of the Great Bear” purchase it here. At the Kodiak Scandinavian Culture and Film Fest I will be showing films from my 35+ years on the island. 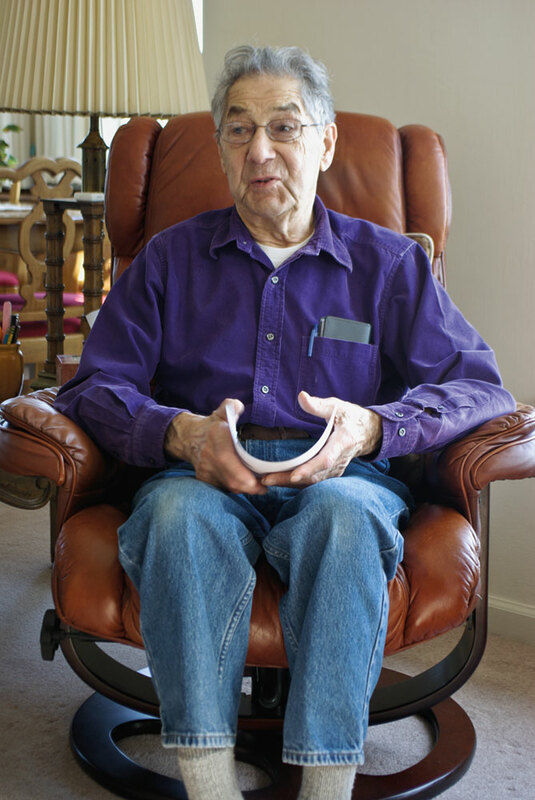 Meet Bill Burton and many other “old timers” in the film Voices of Kodiak. See festival site for more information. Emil Norton’s father, Johan Norgård, was born in 1870 to Swedish parents in Vasa, Finland. Their family was poor, so Johan left home when he was 16 and went to sea. He arrived in the USA later the same year, 1886, and tried to join the navy. The recruiter asked him how old he was. But Johan didn’t go home, he signed on to another ship for a couple of years and eventually ended up in Alaska. He was working on one of the mail boats when the captain told him that his last name, Norgård, was too hard to spell. Johan changed his name to John Norton. In 1893, John came to Woody Island, a small island not far from the city of Kodiak, where he was offered a job as store manager/fur trapper with a salary of $15 a month. 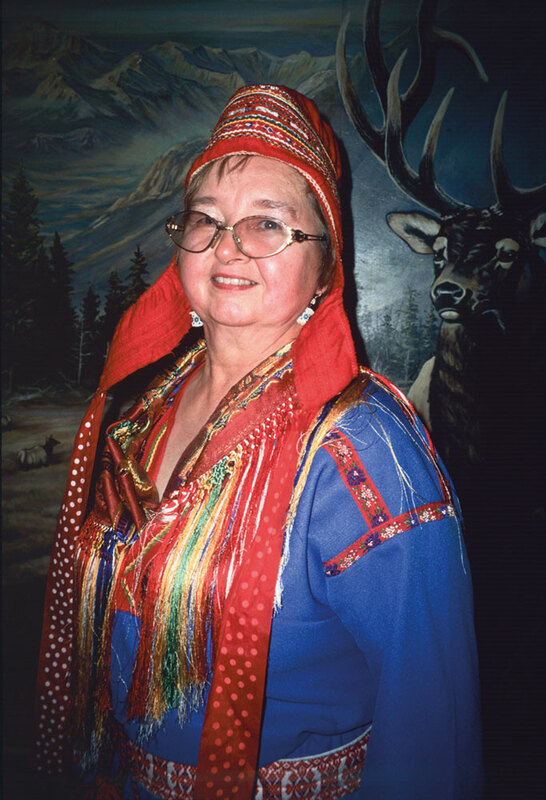 He married a Russian-Sugpiaq woman and, since he dealt primarily with native people, learned to speak fluent Alutiiq. John and his wife had six children. When Emil, the youngest, was one year old, his mother died. The oldest girls helped raise their younger siblings. Emil described his father as a big, strong man. One day an unusual cargo arrived at Kodiak’s harbor, large crates of gold that weighed 250-300 pounds each. John lifted a crate to his shoulder and carried it to land. Everyone watching was astounded by his strength. “The Scandinavian men came from good, hardy stock,” Emil declared. Most of the Scandinavians that came to Kodiak were successful. They married native women and had large families, but they rarely spoke of their homeland or taught their children their own language. “The few words we did learn were swear words we picked up by eavesdropping,” says Frieda, shaking her head. John Norton lived to be 88 years old. Emil remembers how, in his old age, his father talked in his sleep, in a language they couldn’t understand. Emil began working when he was 14 years old. His first job was stamping fish crates for 15¢ an hour. He worked in the fishing industry for 61 years before he retired. Uyak Bay where the SS Aleutian went down in 1929. The S.S. Aleutian sailed from Seattle in the spring of 1929 with 300 passengers. Her captain was John Gus Nord, a Swedish-American with an unblemished, 30‑year career sailing the North Pacific. During the night of May 27th, most of the passengers disembarked at one of the canneries where they would be working over the summer. The weather was calm and the visibility good as the ship continued deeper into Uyak Bay with the remaining 15 passengers and a 135-man crew on board. At 5:30 a.m., just south of Amook Island, there was a violent tremor, followed by a horrifying noise coming from the hull. The flagship of the Alaska Steamship Company had struck a submerged rock. Captain Nord, who understood immediately what had happened, ordered full steam ahead, hoping to beach the ship, but she was too damaged. The rock had torn an enormous hole in the hull, and the ship quickly filled with water. With her propellers high in the air, she sank, just seven minutes after the collision. An eerie silence was all that remained after the ship went down, reported one of the crewmembers. Not even a ripple disturbed the surface of the water. In what was later lauded as the most efficient act of live-saving at sea, the captain and his crew deployed the lifeboats and evacuated everyone on board, with one exception. Manuel Dorras, a young crewman, drowned when he left the lifeboat, returning to the sinking ship to rescue his lucky horseshoe. Everyone was stunned by the tragedy and their narrow escape. Captain John Gus Nord never quite recovered from the shock. He mourned his ship as if it were his own child. It was assumed that the S.S. Aleutian had sunk in very deep water, and no attempts were made to salvage her. In 2002, seventy-three years after the accident, Steve Lloyd, author and shipwreck historian from Anchorage, Alaska, found the ship resting just 220 feet below the surface. Following the dive line into the inky darkness the first sight of the ship is the two masts, now covered in white anemones, rising out of the darkness like ethereal watchmen. The ship is still intact after all these years despite the powerful currents. Shipworms have devoured most of the wood fittings but the hull remains, and the Aleutian is now a living museum, deep below the surface of Uyak Bay. Don’t miss our first ”Kodiak Scandinavian Film and Culture and Festival” on Kodiak, Alaska, November 6-12, 2017. See www.cameraq.com for more information. The discovery of the Kad’yak made headlines all over the nation. The California gold rush, which started in 1849, flooded the state with people and increased the general wealth. Along with a higher standard of living came a greater demand for ice, which was a difficult product to obtain and deliver. By the mid-1800s, the economy in Russian America had hit bottom. The sea otter population had diminished, and the fur trade on Kodiak collapsed. Thankfully, a new source of income presented itself. In 1852, the lake on Woody Island, an island near the city of Kodiak, became one of Alaska’s most valuable assets. In the winter, the ice on the lake was sawed into blocks and shipped to San Francisco. When the first load sold for $75 a ton, the Russian American Company realized that ice was a very profitable commodity. They soon had competition, however, when the first ice machines were invented. Twenty years later, machines had taken over the business entirely. The Kad’yak was one of The Russian American Company’s smallest ships. She was a three-masted bark, 120 feet long and 30 feet wide. Her hull was covered in copper to prevent the growth of barnacles and other marine organisms. On March 30, 1860, the Kad’yak left Woody Island bound for San Francisco, loaded with 356 tons of ice. Perhaps he was running late, or perhaps Captain Illarion Arkhimandritov was not superstitious. For whatever reason, he failed to observe the usual custom of paying his respects at Father Herman’s grave to receive a blessing for the voyage. Locals would later blame Kad’yak’s fate on this omission. Shortly after setting sail, the ship hit a rock, tearing a large hole in the hull and quickly filling with water. The crew abandoned ship and went ashore in the lifeboats. But the ship didn’t sink. Her cargo of ice kept her afloat, drifting between the islands. Four days later, she sank in Icon Bay, off of Spruce Island. 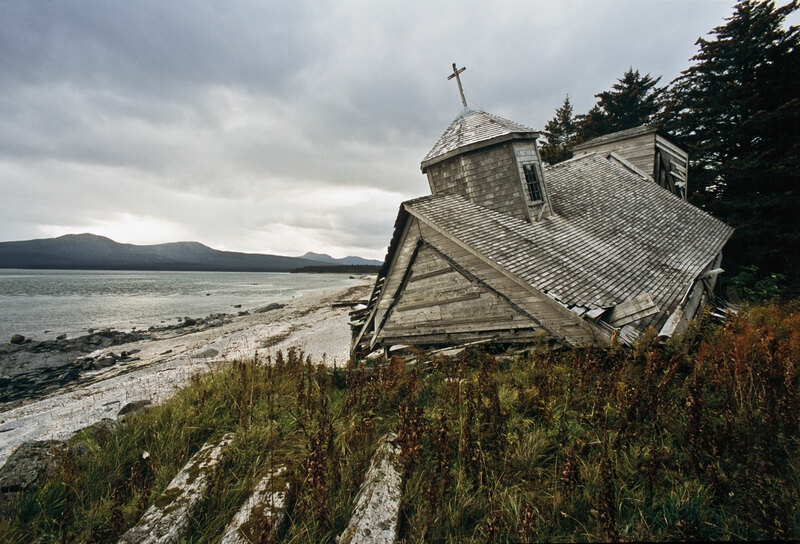 Ironically, the top of the ship’s mast and yardarm, still visible above the water, formed a cross marking her watery grave, directly in front of Father Herman’s chapel. Since the 1970s, people had been searching in vain for the sunken Kad’yak, using the location parameters recorded in the ship’s log. Bradley Stevens suspected that those parameters had been misinterpreted and,143 years after she sank, believed he had new clues about Kad’yak’s position. 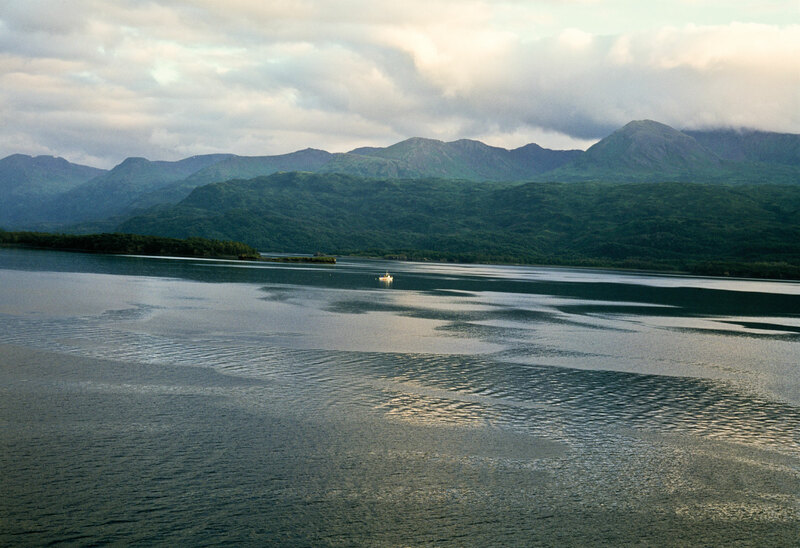 On July 21, 2003, we left the Kodiak harbor on board the Melmar. Our captain was Joshua Lewis, a teacher and fisherman from Kodiak. With great expectations, we arrived in Icon Bay, lowered the magnetometer into the water and fastened it behind the boat. A magnetometer, a device that resembles a miniature submarine, is an ultra-powerful metal detector that can detect metal buried or submerged far below the surface. Towing the magnetometer back and forth, we mapped the floor of the bay. When we reached the position Bradley had marked on his map, the magnetometer indicated the presence of large metal objects. Could it be the Kad’yak? We began diving that afternoon, and by evening, we had found several pieces of copper. Cautiously optimistic, we returned to Kodiak. Early the next morning, we were back in Icon Bay, and on our first dive, we found what appeared to be part of the ballast. We also found two cannons, an anchor, and a chain that matched the time period of the Kad’yak. Convinced that we had made a substantial discovery, we reported our findings. The news spread across the nation, and all diving was stopped in Icon Bay. 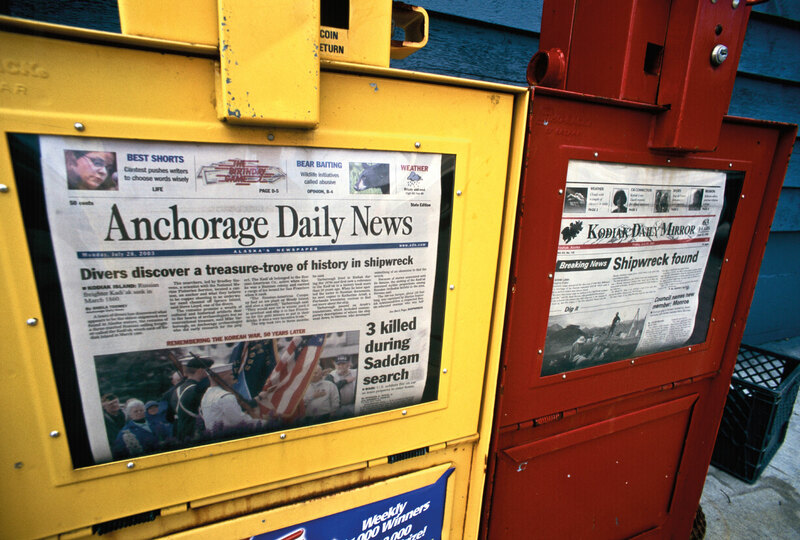 Because of the historical significance of our find, all exploration rights for the shipwreck had automatically transferred to the State of Alaska. The following summer, the East Carolina University organized a marine archeological excavation of the lagoon, and we who had found the shipwreck were invited, somewhat reluctantly, to join the expedition. With support from NOAA and the National Science Foundation, the university had the resources and the competency to complete the task. Though many artifacts were uncovered during the excavation, the most significant find was the copper hub of the ship’s wheel with the name “Kad’yak” inscribed in Russian letters, which positively identified the shipwreck. When the excavation was completed, the remains of the Kad’yak were again buried in sand. A large portion of the hull and other artifacts from the ship lay in wait for someone with the authority and the resources to uncover her secrets. Barring that, Captain Arkhimandritov’s old ship will rest in peace at the bottom of the lagoon for centuries to come.